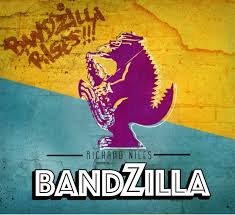 Composer, arranger, guitarist and producer, Richard Niles' "Bandzilla Rises" CD according to drummer, Danny Gottlieb, "is a masterpiece of contemporary music that the music world needs now more than ever". Sporting fourteen distinctive originals by Niles (both music and lyrics) it includes titles like LA Existential and Stone Jungle to Tip for a Toreador and The 5th Elephant. Don't even ask about making sense of the titles or interpreting the lyrics, etc as being an arranger myself there is not enough that I can enthuse about of the writing and performing aspects of this recording. Quite complex and sophisticated throughout yet accessible and sending a very positive message with no shortage of wit and blindingly stupendous instrumental soloing and craftwork. Niles, whose impressive CV and pedigree precedes him, spent a forty year career in the UK writing and producing such artists as popsters Swing Out Sister, The Pet Shop Boys, and Sir Paul McCartney to jazz legends like Pat Metheny and Ray Charles. Probably, for my money, the most eclectic and versatile collaborator with leading artists from so many genres that I can think of. His first Bandzilla recording was released in 1987 and what a welcome (and overdue) follow up this is indeed. Having relocated back the LA in 2012 the current Bandzilla incorporates soloists and singers from both sides of the pond. These include Brit blowers like Steve Hamilton, Nigel Hitchcock, Mark Nightingale and Ian Palmer: singers, Kim Chandler and Daisy Chute to icons like Randy Brecker, Leo Sayer, Lamont Dozier Jr and Paola Vera (for crying out loud..). As it appears, that there is overdubbing and layering the puzzle together over an ocean in gradual stages over a period of time one doesn't get the sense of a concerted ensemble playing together on each piece as was the case on the 1987 "Blue Movie" release. The important point though being that "Bandzilla Rises" is still Richard Niles, through and through- sounding fully complete and homogenised delivering his unique sound and message to the listener. As longtime colleague and friend, Pat Metheny (Rich studied with him at the Berklee School in Boston in 1969) says on the liner note "You are the one and only you, Richard, and you've done it again here!" Here, hear, indeed and lets hope that Bandzilla will rise again and again and hows about a live tour in the UK at some stage for starters? Wouldn't that be a treat. Come back, little Richard, come back and play for us. Thanks for the review, Frank. Coming from such a great writer it means a lot!